Filmed at a one-day seminar in Lisle, Illinois, this 3-part DVD set shows why Dr. Patricia McConnell is one of the nation's leading experts on canine aggression. 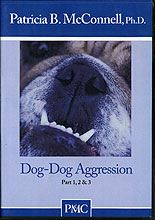 Through demonstrations and lecture, videos and slides, she shows the causes behind dog-dog aggression and demonstrates humane and effective techniques to treat it. The first half of the seminar addresses dogs who are aggressive to unfamiliar dogs (especially if leashed) and the second part examines aggression within the home. This entertaining and informative seminar gets rave reviews from participants, because it's chock full of practical, effective solutions to a common problem. Dr. Patricia McConnell received her Ph.D. in Zoology from the University of Wisconsin-Madison researching dog behavior and communication between professional trainers and working domestic animals. She is currently the owner of Dog's Best Friend Ltd., and Adjunct Associate Professor in Zoology at the University of Wisconsin-Madison, teaching "The Biology and Philosophy of Human/Animal Relationships." Co-host of Wisconsin Public Radio's "Calling All Pets," Dr. McConnell gives advice about behavior problems on over 100 radio stations across the country. She is the behavior columnist for the BARk magazine ("the New Yorker of Dog Magazines") and a Consulting Editor for the Journal of Comparative Psychology. She is the author of the much acclaimed book "The Other End of the Leash," as well as a highly respected series of booklets on the treatment of behavioral problems. McConnell is a sought after seminar speaker, giving seminars and speeches about canine and feline behavior around the world.